Content Creation vs Curation: Which Is Better For B2B Lead Generation? Content marketing can be difficult for any B2B sales organization. A lot of time and effort must be put into creating quality content that will result in the highest possible conversion rates and lead generation. Not only does this require a lot of thought and planning, but it’s also very time consuming and it can be challenging to come up with original ideas for new content. This is why many marketers rely on content curation, the sharing of content that others have produced, to fill gaps in their editorial calendars and increase the volume of content they’re producing. But, when it comes to starting and nurturing B2B conversions, which is better: creation or curation? While this may seem obvious, when you create your own, original content from scratch you never have to worry about copyrights or attributions. This also means that you can repurpose and share this content as often and in any way that you like. This is the best way to get the biggest bang for your buck when it comes to publishing content. The number one goal when creating content is to make sure you’re creating it with your buyer personas in mind. If you’re the one producing this content, you’re already creating it in the way that will best resonate with your targeted audience. You don’t have to worry about putting a spin on it or highlighting certain aspects of it to make sure that it’s something your buyer personas will be interested in. It’s easy to align it with specific campaigns. You can easily align the content you’re creating with other campaigns you currently have going on. Alignment can be difficult when you’re relying on content being created by others. With curated content, there is some potential for improving SEO, but most of the SEO benefits will go to the content’s original creator, which is why it’s so important to create your own original content. Curating content is efficient for engaging potential customers that are at the top of the funnel, but as these potential customers progress further into the funnel, you’ll need original content that’s targeted specifically to each level of the funnel in order to be a valuable resource and attract customers beyond their first visit to your website. By putting your own spin on someone else’s content and framing the information in a way that will be of value to your targeted audience, you establish yourself as a valuable and trustworthy resource. For example, Doug recently wrote a post about Burger King and McDonalds and got a lot of conversation from it. When curating content, you shouldn’t expect anything in return for sharing the creator’s original content, but this is often a great opportunity for partnerships and co-marketing opportunities, which are a great way to expand your current reach. You can highlight the key findings or specific facts that would be important to your buyer personas, therefore saving them time so they don’t have to sift through lengthy reports or long research documents. Creating original content can be incredibly time consuming. 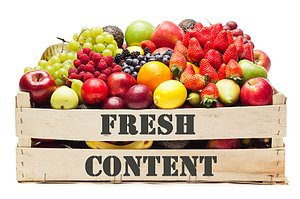 By curating content, you can save time and produce content more quickly, allowing you to increase the amount of content you’re publishing and stay fresh in your audience’s mind. So, which content creation method is better for lead generation? The answer is a combination of both. Original content is essential for lead generation and should be the cornerstone of your content marketing game plan, but curating content is a great way to enhance your efforts and give your content marketing a strategic boost.